Tools for Torah: Established in 2008. Not For Profit Organization called: TAG613, Inc.
New! First Ever Animated - Living Siddur! Click here to see the Siddur Come Alive! Geared towards preschool thru grade 2, Shema with Rabbi Chayim on FaceBookLive is a weekly event, on Tuesdays from 6:30pm-6:45pm in which your child/student is invited "end the day the Jewish way" reciting the Shema, preceded by a short Parsha/DvarTorah and popular Jewish songs, played and sung by Rabbi Chayim B. Alevsky and his trusty guitar. One of the unique features of this program is that Rabbi Chayim will mention the names of the participating children, if their names are placed into the comments DURING the event! Like the RabbiChayim page to get live event notifications and Share the Shema! 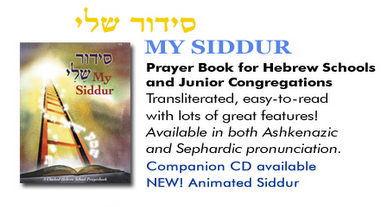 Get your Siddur & Bentcher as Ipad/Iphone Apps! NEW! My Siddur for ANDROID! Create Light on YOUR sidewalk! 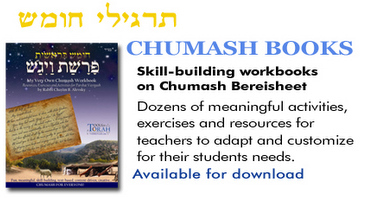 Chumash Workbook, Holiday Guide, CD recording, Laptop or Real People in need! Learn about and download the NEW App Chinuch in a Minute here. 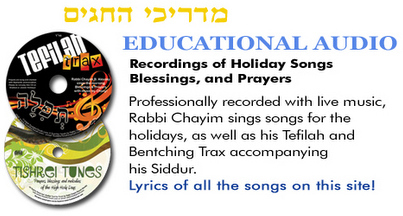 Need Bar Mitzvah Lessons for your child or student? Email we will use the NEW! Awesome Interactive Bar Mitzvah Trainer! One of the most popular transliterated Siddurim in our time. of any of our educational materials in honor or memory of a loved one?